Here is a quick round-up of my current work experience. I am the Trade PR Officer for The Scotts Miracle-Gro Company and edit & update the company's website - www.lovethegarden.com - as well as run the e-newsletters. I am the product writer and tester for Garden News, producing monthly Buyer's Guides and Tried & Tested features. I regularly write for Grow Your Own magazine. I regularly present the Garden Bargains programmes on Ideal World TV. I am a gardening correspondent for BBC Radio Cambridgeshire and a regular guest on other local BBC radio gardening programmes, especially BBC Essex. I am a regular member of various gardening question times panels at large flower shows - such as Hampton Court Palace, Harrogate, Malvern and Southport - as well as smaller, local events. I am appearing on The Daily Mail Gardening Question Time Roadshow throughout 2011/2012. I write copy and record horticultural and general promotional messages for Garden Radio - the in-house music and messaging service for garden centres. I have written, edited, proofread and checked a number of gardening books. 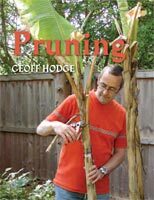 The latest books I've written include Pruning, published by The Crowood Press and The RHS Allotment Handbook, The RHS Allotment Journal, RHS Propagation Techniques and RHS Pruning & Training. I produce the Yearbook for The Garden Media Guild and am the Guild's Web Editor - and was Chairman from 2000-2003. I write gardening articles for lifestyle magazines and websites. I give talks to gardening clubs and horticultural societies on a variety of subjects and am on the Royal Horticultural Society's Register of Speakers. I judge gardens (I am the Gardener of the Year judge for Garden News), gardening competitions and horticultural shows, and have judged garden centres for the Garden Centre Association. I was the Gardening Editor for Garden News (seven years) - Britain's leading weekly gardening publication. Before that I was Technical Writer for Garden Answers magazine (three years). Previously I managed a large independent garden centre. I was a presenter for seven years on Gardeners' Diary - a weekly gardening TV programme - which was networked to ITV regions and Sky TV. I answered readers' questions for Garden News and Garden Answers magazine. I have a BSc degree in applied botany from Reading University.